Campaign Signs Printed Election Sign Boards. The Correx Printed Campaign Signs produced by GJ Plastics Ltd, digitally printed with the latest UV ink technology direct to the Correx Boards, offering you a brilliant solution that is eye-catching. Political Parties Sign Boards direct printed with waterproof UV inks. 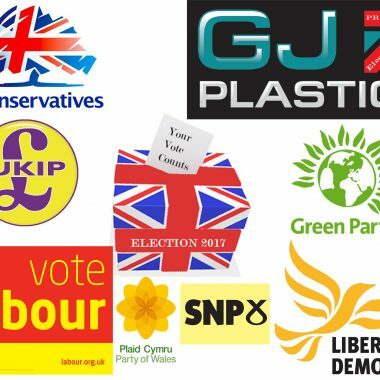 If you are campaigning, be it locally, or nationally GJ Plastics are happy to produce your printed Election Signs. If you need small quantities of printed signage, we can happily supply within a few days, however, creating hundreds or several thousand may take a little longer. We understand that you want to maximise your marketing while working within a budget, this cost effective election voting or advertising boards will allow you to do so. Campaign Signs are vital to promoting your party, candidate and ensuring your political message delivered in a powerful and efficient manner. Location of your election signs is an essential element for you consider, high traffic area are perfect, but please ensure you have the correct authorisation to place your signage. Areas close to schools are also prime sites as parents drop off or pick up their children. Business locations, cafe, and restaurants can also be useful places to install your voting signage. 4mm thick Correx is robust enough to withstand most weather issues, and the UV inks are waterproof. We can at an additional cost print your signage to 6mm thick Correx (predominantly used by estate agents for signboards). If you want to contact us to talk about any of your specific requirements or questions on your artwork on the election signs, we will be happy to assist you. GJ Plastics have just won Sign Maker of the Year UK; we have our own in-house direct to substrate printing department. Printing on a variety of materials for signage such as Correx, Foamex, Dibond, Acrylic and PVC Banner. 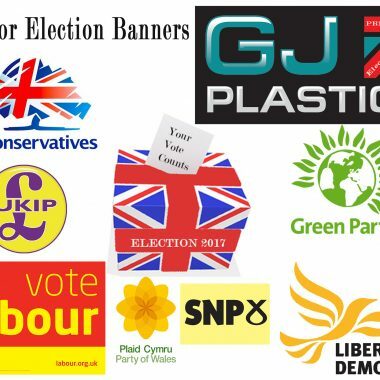 If you prefer a PVC banner with eyelets with your Election related slogan on, please contact us! You can purchase Our PVC banners.